The isotope analysis described here, known as Stable Isotope Analysis, takes advantage of the fact that any organic material on earth is composed of chemical elements. The elements constituting the major fraction of the biomass (which are hydrogen, oxygen, nitrogen and sulfur) are composed of more than one stable isotope. As a result, all plants, animals including all their products and also human beings are naturally composed of isotopes. Because of the continuous conversion in (local) biochemical cycles, the isotope composition of the bioelements varies from place to place. Since the biomass (of a living being like an animal or a plant) is made up of the material in the surrounding environment, the environment's isotope composition is reflected by the biomass, i.e. a product coming from a certain place may show a significantly distinguishable isotope composition when compared with the same product from another place. Hence, any biomass, and therefore e.g. 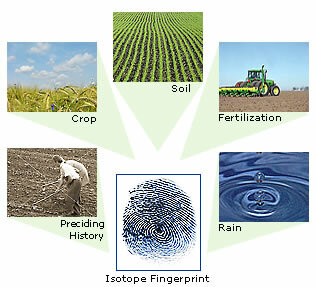 any food item, exhibits a – non radioactive – natural tag, which is the so called "isotope fingerprint". This fingerprint is not visible and it cannot even be altered by chemical additives or by processing. It enables to ensure the retraceability of organic material all the way back to its place of origin. Thus not only the country or region of origin can be determined, also the producing farm, ranch or company can be identified. The elements of life – hydrogen, oxygen, carbon, nitrogen and sulfur – occur in a number modifications of different weight. These modifications are called the isotopes of a (given) element. Hence, there are elements that exist in nature as modifications with different atomic weights called isotopes of that element. Stable isotopes of an element are not radioactive because they do not decay. Isotope numbers are normalized to an international standard and expressed as deviations in terms of one tenth of a percent (). Water is the source of all life on earth. However, water is not equal to water: The world wide water sources are distinguishable by their individual isotope composition. The world's oceans contain over 97 percent of all free water of the earth's surface. The evaporation of this water taking place at the earth's large ocean covered surface area causes the formation of clouds. The evaporated water drops out of the atmosphere again as rain, then it evaporates and rains down again. Throughout this entire cycle, the water is following the movement of the great air masses and changes its isotope composition continuously. It is because of this fact that a specific isotope number is shaping up for every region on earth which can be detected in the region's precipitation, plants as well as in any water containing product. 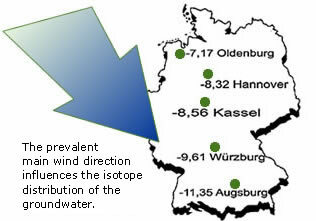 In Europe, an isotope gradient from west to east is generated by a prevalent west wind, and the world wide effect is additionally causing a decline from south to north. The geographical isotope distribution of the water thus allows a precise identification of the origin of products containing water. . For this reason, the water's isotope-ratios D/H and 18O/16O are referred to as "geographical factors". All plants incorporat nitrogen and sulfur from the soil into its biomass and ,thereby, is reflecting the conditions of its direct surrounding. The differences found in nature are due to the fact that the earth's entire biomass is being converted continuously by bio-geo-chemical cycles of matter. These conversion processes also cause a continuous change of composition of the isotopes. Inside the plants, specific metabolic processes additionally generate a very distinct isotope pattern. Hence, plants mirror the specific, unique conditions of their location – they therefore contain the so-called isotope fingerprint. The isotope conditions of nitrogen and sulfur are being determined by their replenishment rate out of the soil and partly by immissions out of the air. 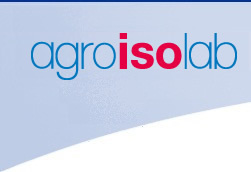 For the liberation of these isotopes in the soil, not only the particular fertilizer in use plays a role but also preceding fertilizer applications including organic shares. These locally varying conditions allow a localized allocation. Both parameters are therefore called "local factors". In case of animals, the 15N/14N-ratio of the food they received is found in their corresponding biomass or their products (e.g. eggs or meat) shifted by a certain amount. The 13C/12C-ratio of the carbon is determined by two different types of metabolism, the C3- and C4-plants. Most of the wild and agricultural plants belong to the C3-type (e.g. wine and sugar beets). ). In contrast to that, the most prominent representatives of the C4-plants are corn and sugar cane. Accordingly, quality aspects of the corresponding products can be evaluated on this basis and evidence about the food the animals received can be collected.